The start of the Olympics in Rio this week has been shadowed by a storm of bad news — not including a Zika outbreak that prompted 150 health officials to recommend moving the games out of the city as a public safety measure. Demonstrations, violent crime, infrastructure failures and poverty are set to greet spectators this weekend in an event that some economists say could mean upward of $15 billion in losses for Brazil. Brazilians are tangled in a state of political turmoil and economic uncertainty that was not as apparent in 2009, when the decision was made to hold the games in Rio. This year Brazil's Senate impeached Dilma Rousseff — the country's first female president, who helped deliver the games to Rio — over accusations that she doctored accounts in order to portray a more optimistic economic outlook during her re-election bid in 2014. ABC News reported in May that Rouseff compared the pain of being impeached to the torture she suffered under the country's military dictatorship, which lasted from 1964 to 1985. Michel Temer, Rousseff's vice president, has stepped in to serve as interim leader. Other lawmakers, including leaders of Brazil's Congress, have been accused of corruption, and political protests have become a regular feature on the streets of Rio. Demonstrations with "tens of thousands" of people have been held as recently as this weekend, according to McClatchy. 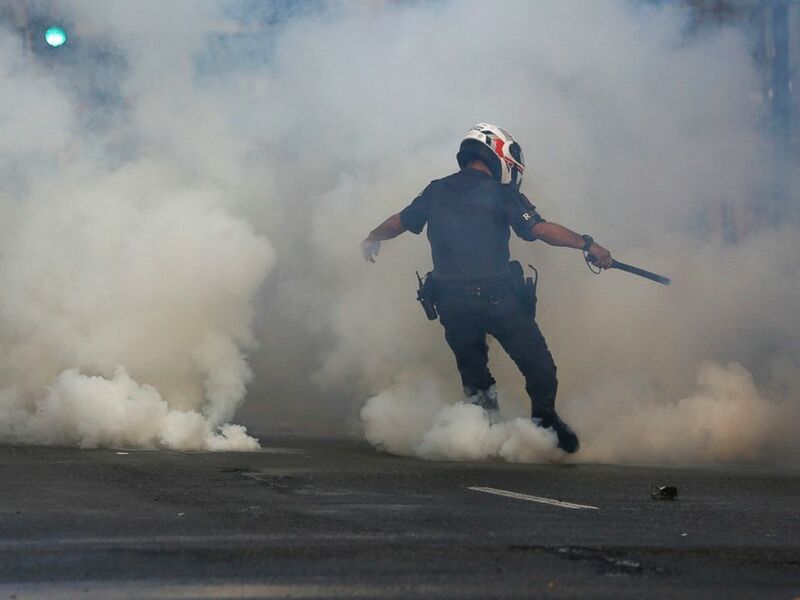 A policeman kicks a tear gas canister as supporters of Brazilian suspended President Dilma Rousseff protest against interim president Michel Temer, in Sao Paulo, Brazil, June 1, 2016. Last week a foot and other body parts appeared on a shore where next week Olympians will be playing volleyball. The body parts were a stark reminder that Brazil has a serious problem with murder. An NPR report noted that almost 60,000 people were murdered in Brazil in 2014, most with guns, making it what it called "the deadliest place in the world outside Syria." The Overseas Security Advisory Council, an arm of the U.S. State Department, said that drug gangs play a large role in violence in Rio. 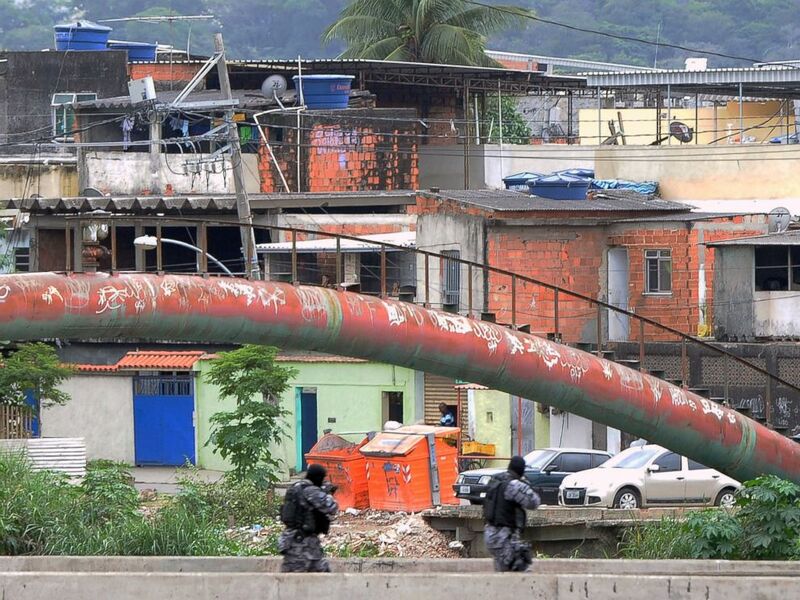 "Organized crime in Rio de Janeiro is controlled by major drug gangs," the council reports. "Low-level criminal activity continues to plague visitors and businesses alike. Drug dealing, petty theft and vehicle break-ins are common." The report adds, "The crime in Rio's favelas is certainly a product of organized crime, mostly centered on narcotics trafficking." The beaches, which will be used for the games and by vacationing visitors, are not completely safe, the council says. "Assaults are common on beaches or in parks after dark," the report notes. 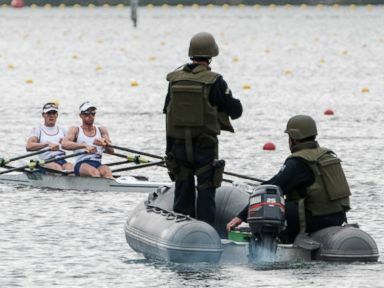 Rights groups have highlighted the rising number of police shootings in Rio before the games, as ABC News reported. PM paramilitary police personnel man a checkpoint on a bridge in the Cidade de Deus shantytown, 10km from the Olympic Village Rio de Janeiro, Brazil, July 21, 2016. Marselha Gonçalves Margerin of Amnesty International told ABC News that Rio police are "cleaning up" before the events, which the organization believes is sparking the recent rise in deaths caused by police. According to government statistics for this year, she said, 35 police killings were reported in April, 40 in May and 49 in June. She said that in some sectors of the city, organized crime has "replaced government." In April of this year, hours after the Olympic torch was lit in Greece to make its way to Rio, a massive wave on the city's Atlantic shore reached up and ripped away a 50-yard stretch of Ciclovia Tim Maia, a bike path created for the games, at an estimated cost of more than $12 million. The incident killed at least two people and resurrected worries about Rio's readiness to tackle such a massive project. The news since then has been less than ideal. 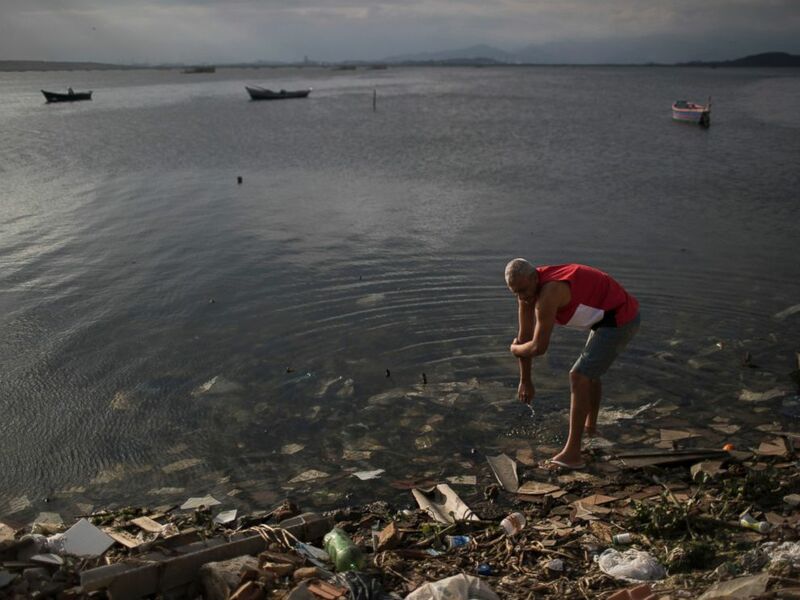 A survey by the Associated Press indicated that the waterways of Rio were "contaminated with raw human sewage teeming with dangerous viruses and bacteria," putting "some 1,400 athletes at risk of getting violently ill in water competitions." A man washes himself in the polluted waters of Guanabara Bay in Rio de Janeiro, Brazil, July 30, 2016. Observers describe unfinished construction projects, the droning sound of jackhammers and massive traffic jams that don't portend well for a city of over 6 million people that is about to see an influx of hundreds of thousands more. When Temer oversaw the delayed opening of a metro line extension this weekend, he helped finalize what has been a large and risky bet for the country. Andrew Zimbalist, a Smith College professor of economics, estimated that the games will cost Brazil $20 billion and return only $4 billion to $4.5 billion — a steep price to pay for a country that is plagued with infrastructure problems and endemic poverty. He described awarding the games to developing countries like Brazil as a relatively new phenomenon. "The International Olympic Committee sells the games to countries on the promise that it will help them, but scholarly evidence suggests that long-term benefits are not forthcoming," he said. About 9 percent Brazil's roughly 200 million people lived on less than $3.10 per day in 2013, according to the World Bank. Zimbalist noted that the decision to host the games in Rio was made in 2009, during what appeared to be an upswing for the Brazilian economy, but that the outlook has now become considerably more cloudy. He said that the investment in the games was unlikely to rev the country's economic engine. Zimbalist said the newly opened metro extension would have been the "fifth order of priority" if Brazil had focused solely on infrastructure for its citizens, because it transports people to and from Olypmic venues and tourist beaches rather than the north and west of the city, where he said the majority of working people live. He said that driving was "like being in a parking lot" because of the traffic and that a public transit system that helped reduce some of the burden on roadways would be significantly more beneficial to the city. He described the cable car system that takes people over the city's famous favelas, where the majority of its poor live, as allowing people to "gawk" at poverty and suggested that the money could have been used for better plumbing, sanitation and sewers. Another point of contention Zimbalist made with Brazil's spending concerned the golf course built for the games, noting that it "wasted land and water," two things in short supply in Rio. "You're spending over $20 billion to get $2 billion in infrastructure return," he said. "Why not just spend the money directly on things you need?"